Hitachi cylinder stubs with 15, 25 and 32mm diameter. The EM-Tec SEM stub gripper tweezers tips for the grooved pin stubs fit directly in the groove of the SEM stub; the angle between tip and handle is 45°. The EM-Tec SEM stub grippers for the cylinder stubs are designed to grip the SEM cylinder stubs from above; the angle between tip and handle is 30°. For the grooved Ø12.7 and Ø25.4mm pin stubs, there are also scissor type SEM stub grippers available; the provide a stronger grip than the tweezersstyle stub gripper. 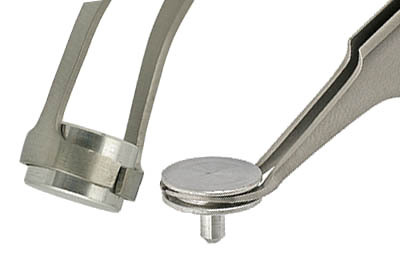 The scissor type SEM stub grippers are made from anti-magnetic stainless steel. The SEM stub grippers can also be use to pick up a variety of other type of samples with similar diameters as the SEM stubs. Metallographic embedding of 25 and 30mm or 1” and 1-1/4” can be handled or used when etching the surface of the samples. Substrate discs can be picked up at the edge. Technical Support Bulletin: Material for EM-Tec SEM stub gripper tweezers.